Can you afford to buy a home in Japan? And should you versus renting? Home affordability has decreased for the average income earner in Japan for the last several years. This is based on data recently released by Tokyo Kantei’s annual home affordability survey. First, can a foreigner even buy property in Japan? Should I buy, or does it make more sense to rent? Can I get a mortgage from a Japanese bank? Where can I get more information (or better yet, a one-on-one- consultation)? Yes. 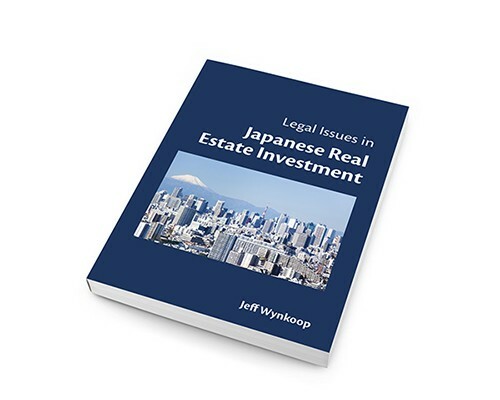 There are no legal restrictions on buying property in Japan for foreigners. Foreigners are only responsible for providing a written notification to the Bank of Japan within 20 days of purchase of real property. There is no need to have citizenship or even a residence visa to buy a house in Japan. However, buying property in Japan does not entitle the purchaser to receive a Japan residence visa. Is it better to buy or rent a home in Japan? The calculus here is very personal, of course, and has much to do with how long you plan to be in Japan, your life goals, stage in life, whether you plan to sell the property when you move out or whether you want to rent it out for income and so on, but from a financial perspective, there are a few basic rule-of-thumb calculations you can make. By one calculation, (considering purchase fees and the various upfront and annual taxes), the typical buyer may not break even versus renting unless they plan to buy and stay in the property for at least seven to eight years. If you are considering buying a home, it’s essential to know what you plan to do with the property if and when you move out. If you want to learn more about this decision, it is often useful to get a one-on-one consultation from a local agent. 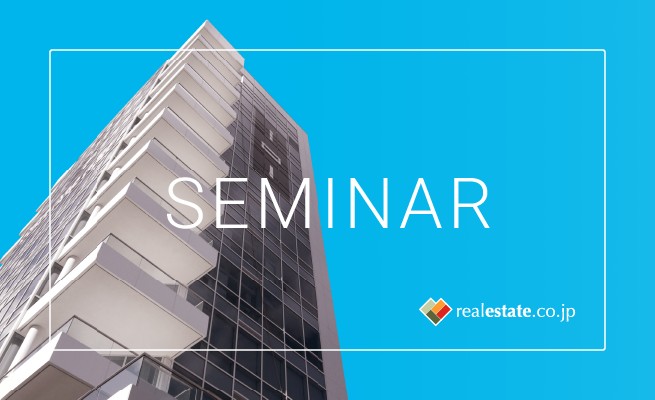 Real Estate Japan Inc. and our partner, LINC KK, will be holding a series of free seminars in the coming months on Buying Your Dream Home in Japan. The next available seminar will be held November 1st at our offices near Tokyo Tower in Higashi Azabu, Tokyo. Learn more and sign up here: Seminar on Buying Your Dream Home in Japan. Can I get financing from a Japanese bank to buy a home in Japan? Yes, there are a number of Japanese banks where you can apply for home mortgage loan as a foreigner. As we learned in this interview with a local real estate agent on buying a home in Japan as a foreigner, from a Japanese bank’s perspective, their main concern is whether the you will stay in Japan. During the loan re-payment period, the bank wants an assurance that the the buyer will be resident because it is difficult to insure that a borrower will make prompt payments if they are outside Japan. Can you afford to buy a home in Japan? One way to look at this question is to calculate your approximate front-end ratio. This is the sum of your monthly mortgage payment including taxes and insurance as a percentage of your gross monthly income. If you make ¥300,000 per month and your payment is ¥60,000, your front-end ratio is 20 percent. In many countries, such as the United States, many mortgage companies impose an upper limit of about 28 percent on the front-end ratio. In general, lenders in Japan provide financing to individuals who allocate no more than 25% of their annual gross income to mortgage loan payments, but this will, of course, vary by lender and your particular circumstances. Please consult directly with potential lenders. How much do I need for a down payment to buy a home in Japan? You should also have out-of-pocket cash to pay at least 20%-35% of the purchase price (to cover the loan down payment, the earnest money, and various incidental fees at the time of purchase such as taxes and agent fees). You can use our yen mortgage loan calculator to calculate your approximate monthly loan repayment amount based on how much you plan to borrow. Another way to look at home affordability is based on “income multiple”. This measure is more often used to calculate home affordability based on average income as compared to average home prices. It is not a ratio used by lenders evaluating a loan application! However, it gives a broad idea of how affordable a home is for someone earning the average income. The income multiple is the ratio of the average price of a home to the average annual income. The lower the multiple, the more affordable it is for the average income-earner to buy a home. In 2017, the national income multiple was 7.81 for a newly constructed condominium, which means that the average price of a new condo nationwide was on average 7.81 times the average annual income. The 2017 national income multiple for Japan as a whole increased by 0.34 compared to 2016. According to Tokyo Kantei, nationwide, the average annual salary in 2017 was ¥4.48 million ($40,050) and the average price of a new 70-sqm condo was ¥34.98 million yen ($313,000). In 2017, the income multiple increased in 30 of Japan’s 47 prefectures, meaning that home affordability went down for the average income earner in most of the country. The Median Multiple has been recommended by the World Bank and the United Nations to compare affordability in urban housing markets across countries. It is calculated by dividing the median house price in a given market by gross annual median household income. 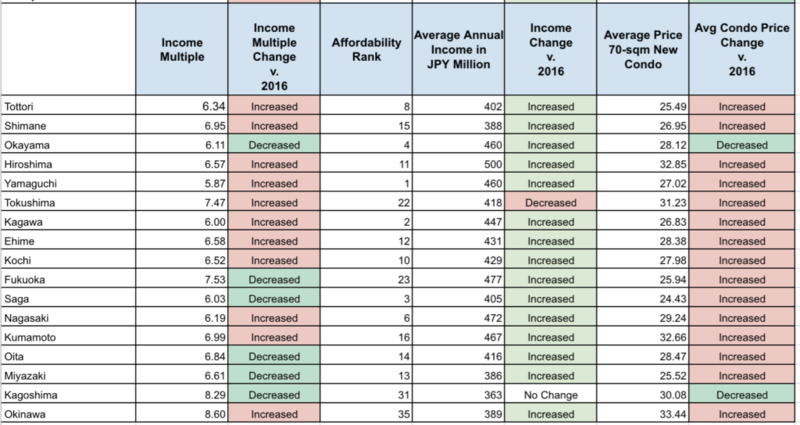 Note that this methodology differs from Tokyo Kantei’s, which uses average prices and incomes, but it is still instructive to compare the two multiples to get a general idea of just how affordable or unaffordable houses are in Japan. Based on the Median Multiple method, buying a new condominium was “severly unaffordable” in 43 of the 47 prefectures for which a complete data set was available. Please see this article to see a comparison of Japan’s income multiple to the median multiple in other countries: How (unaffordable) is it to buy a home in Japan? In 2017, the five least affordable prefectures to buy a newly constructed apartment were (income multiple in parentheses). The following tables show the 2017 income multiple, average annual salary, and average price of a new 70-sqm condo by prefecture and major city.